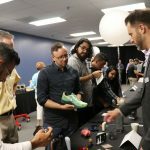 On August 23rd, with the support of Purple Platypus and Stratasys Ltd, California State Long Beach opened the doors of their new Innovation Space (I-Space) facility that holds the latest innovations in the additive world such as the new generation Stratasys J750. 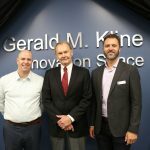 “I think this will give an advantage to the students here that are using these facilities to be able to go out and do their research but also join the industry as well,” said community philanthropist Gerald Kline who funded the I-Space project. 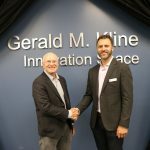 The idea of the I-Space project bloomed over the past two years with the leadership of Roman Kochan, CSULB’s Dean of Library Services and Dr. Christiane Beyer, Associate Professor of Mechanical and Aerospace Engineering. Beyer, heavily immersed in the additive world, was put on the project specifically to determine which machines would be needed for the space. When looking for technologies to include in her lab, Beyer was set on bringing in the highest standard of additive equipment to place in the hands of her students. 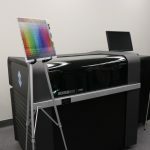 Leveraging the partnership with Purple Platypus and Stratasys, Beyer decided on a J750 and F170. “We had a fantastic experience working with Purple Platypus. We knew each other from before. We actually purchased our first printer, the Objet 30, the printer I have in my engineering lab from them. That was how our relationship started. Since then, over the years we started to work on this equipment,” Beyer said. This new state of the art facility, that is located on the bottom floor of the CSULB library, will be open to all students, faculty, and businesses in the community. If you are interested in learning more about Purple Platypus and Stratasys technologies, please call (949) 474-9222 or email ask@purpleplatypus.com.